Today we have a rather straightforward album. 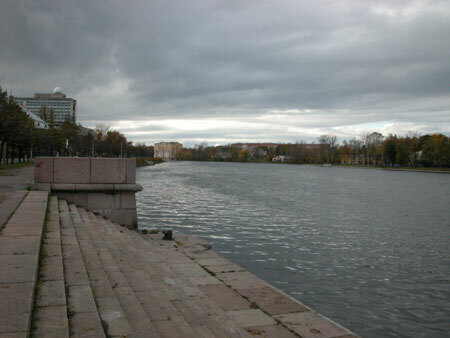 That is, we are going to proceed straight forward along the shore of the Malaya Nevka until the end of Pesochnaya (Sandy) Embankment and take photos of the opposite bank - Kamennyi (Stone) Island, with a small part of Krestovsky (Cross) Island. 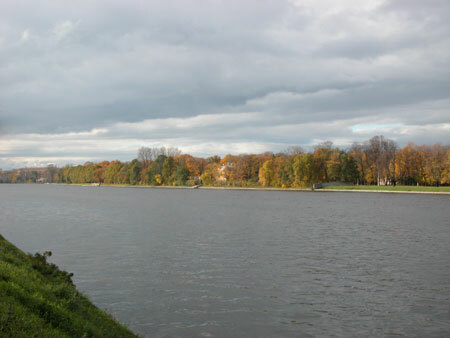 We'll take a turn to the left and follow the Malaya Nevka riverside, first along the embankment, then along a mere sandy riverbank. Designed by Luigi Rusca, 1814. There was a post office in the 1920s and 1930s. I have no idea if they are occupied today. 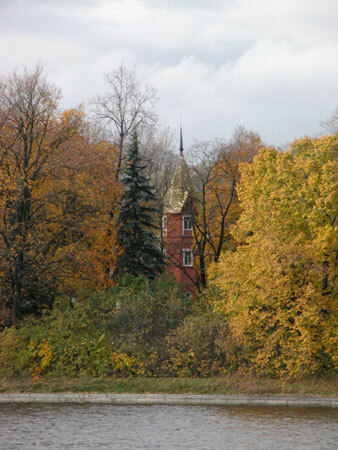 ...is the wooden villa of Prince Peter of Oldenburg. 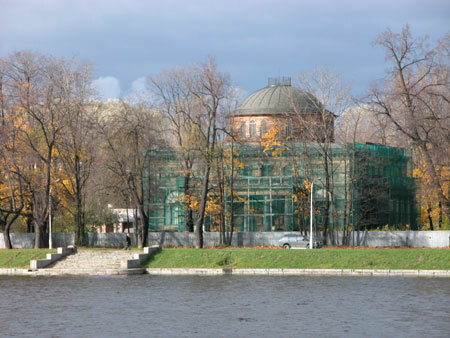 The original building was designed by Smaragd Shustov and Andrei Stuckenschneider in the 1830s. After the revolution it served as an apartment house, then as a hostel. Its residents had been evacuated by 1980 when the building burnt down. The current structure is built of brick and lined with timber panels. The copies of two sphinxes from the Egyptian Bridge were put down at the bottom of the stairs in the 1960s. I am told that they were dismantled prior to the Tercentenary because their sight had been plain ghastly (graffiti, smears, etc). Nothing is known about restoration plans (if there are any). 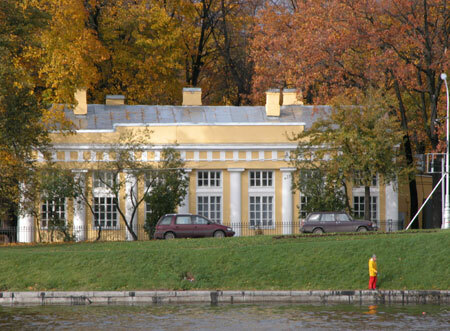 They say that the place was frequented by Alexander Pushkin (who rented a dacha on the nearby Krestovsky Island). 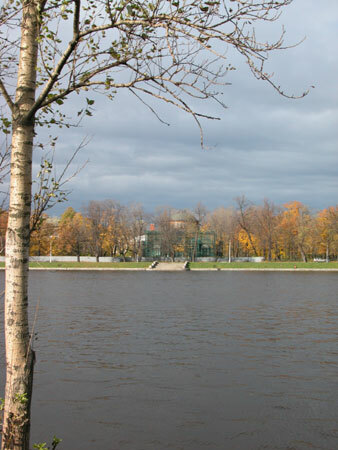 This shot captures almost all of the Malaya Neva riverside of Kamennyi Island. We have already been there, first in the album 31, and later, by snatches. This pre-revolutionary villa houses what is arguably the most picturesque art school in the city. 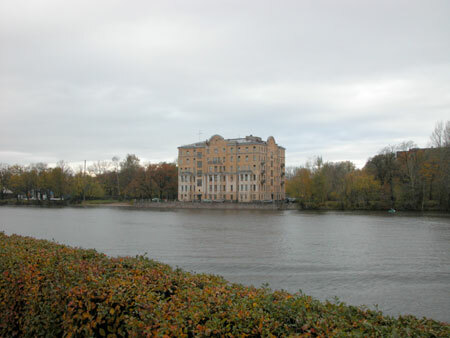 The building was constructed by Constantine Preiss (he was the chief architect of Kamennyi Island) for Princess M.K. Kugusheva in 1895. 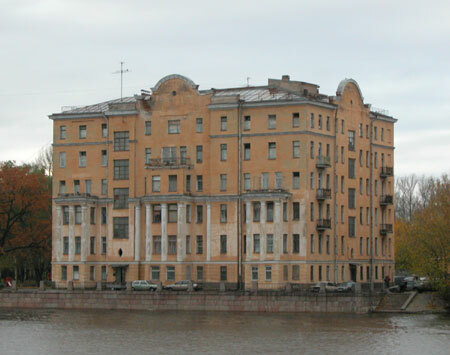 After the revolution the mansion had been occupied by communal apartments. 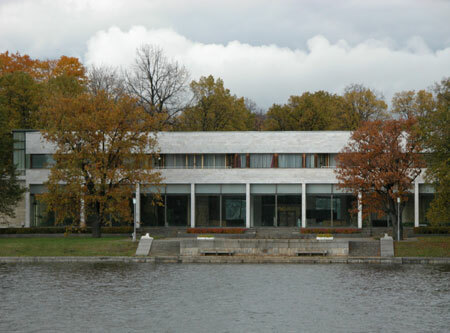 In 1971 its residents were removed and the structure passed to the Kustodiev Art School #10. 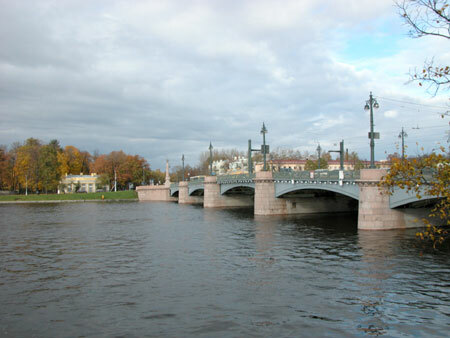 Let's look back at the Stone Island Bridge. 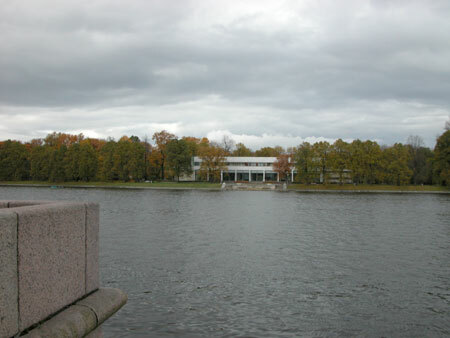 Looking to the left, you will catch a glimpse of the Leningrad Palace of Youth, already discussed in the album 288. Designed by Alexander V. Zhuk, most likely in the 1970s. Sometimes they rent it for hosting diverse public activities. 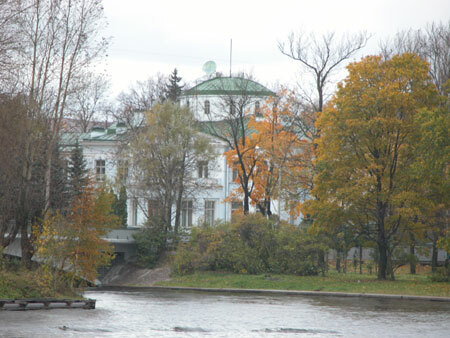 On the left is a guest house, designed by Vladimir P. Apyshkov in the 1910s. 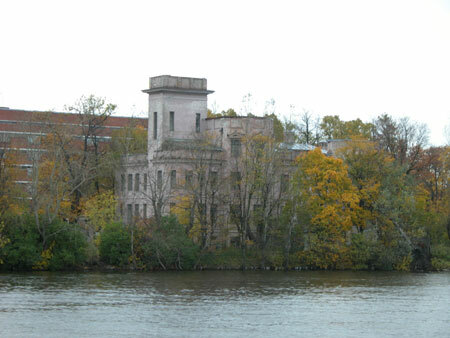 Supposedly the Ruadze mansion (1865), as designed by Georg Preiss. The S.N. 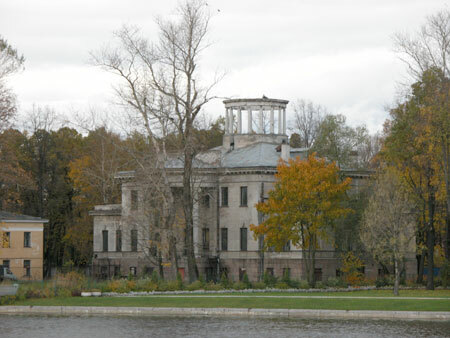 Tchaev mansion was designed by Vladimir Apyshkov. A projected cupola has never been constructed. Although Kamennyi Island ends here, let's make several steps further. 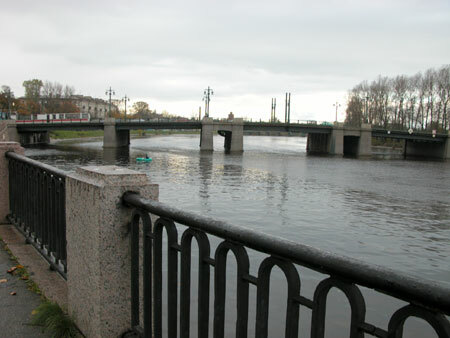 The well-matched Little Krestovsky Bridge connects Kamenny Island (to the right) with Krestovsky Island (to the left). 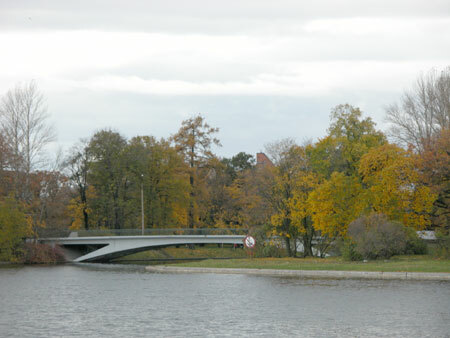 The bridge was designed in 1962 by Yu.L. Yurkov and L.A. Noskov. The house seemingly belongs to the beginning of the 20th century. On the background is a brick infirmary (1970s). 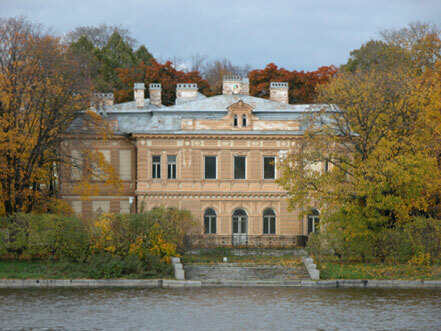 On the foreground is the mansion designed by the architect A.I. Klein for himself (1910s). 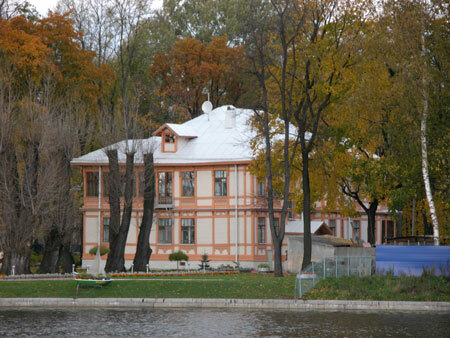 The mansion of Moisei A. Wurgaft was constructed by Moisei M. Sinyaver in 1913-14. Actually its colour is blue, the photo just didn't come out right. 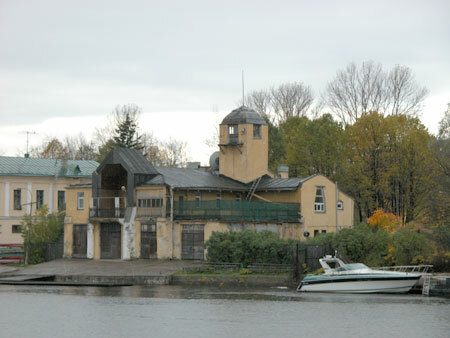 Belying its appearance of a fire-squad department, the building was constructed in the first years of the 20th century for the St.Petersburg Boating Society. 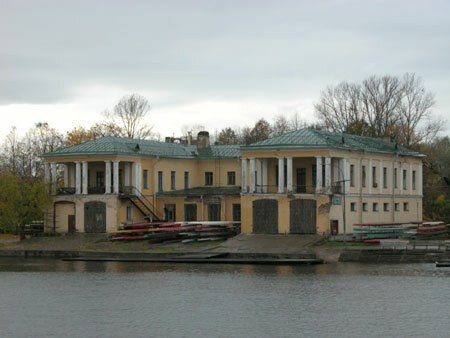 I am told that the structure is quite typical of rowing club headquarters, with its easy slipway to a boom, wide-gated shed, and a balconied upper ward-room. The turret, primarily decorative in purpose, could be employed for inspecting the fairway, hanging out the flags, or just lounging about with girls. 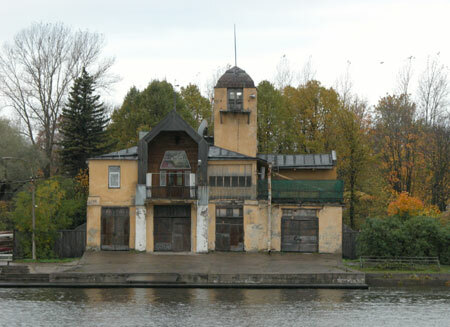 This structure, dating back to the 1910s, was occupied in the pre-perestroika years by the Leningrad Institute of Physical Training. 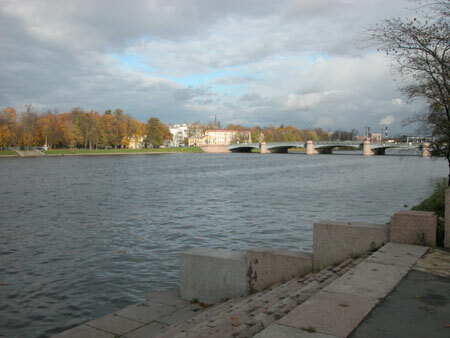 We are ending our stroll at the Great Krestovsky Bridge (Petrogradskaya street). As I haven't managed to identify everything, I welcome any comments concerning architects and occupants of the buildings.